The Eastern Cape Highlands, also known as “The Wild Side of the Drakensberg” is growing in popularity as a safe and un-commercialised mountain destination with spectacular scenery. 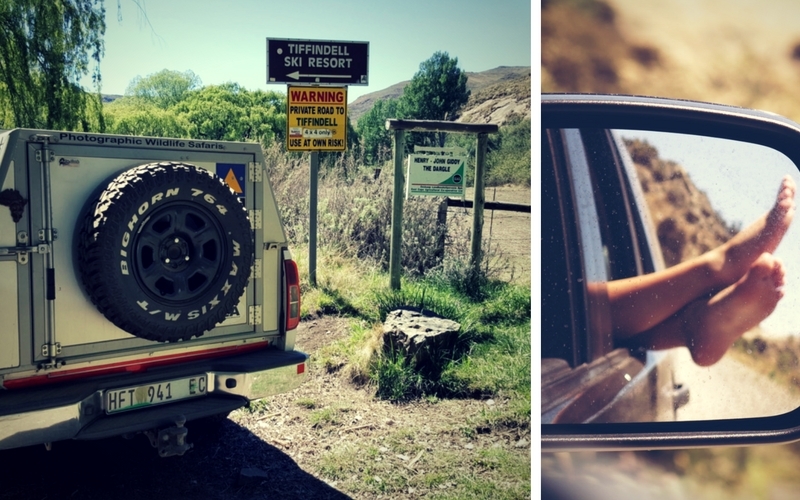 It is an unspoiled area, perfect for 4×4 enthusiasts and currently offering superb value for money.We met each other in Lady Grey where we spent the first night together in the Mountain View Country Inn.On the next day we set out for Lundeans Nek and the Wartrail area. Wartrail is a mountain farming community steeped in tradition. Many of the farms are still inhabited by direct descendants of the original settlers to the area. One of the local farmers, Alan Isted, met us on the road and escorted us through the Wartrail area. We stopped at a certain point togo for a hike up the mountains to interesting caves and rock formations. The scenery is nothing short of spectacular. Lundean’s Nek connects this part of the Eastern Cape to the Lesotho border at Telebridge. We then passed the remote Lundean’s Nek police station – whose primary role is to prevent rustlers taking stolen stock across to Lesotho and to prevent smugglers taking green grass or diamonds in the opposite direction. Just beyond the police station the summit of the pass provides fantastic panoramic views of the Maloti Mountains. We then stayed overnight at the Bidstone Cottages. Alan is the owner of this B&B in the mountains and he will treated us with dinner and interesting stories . 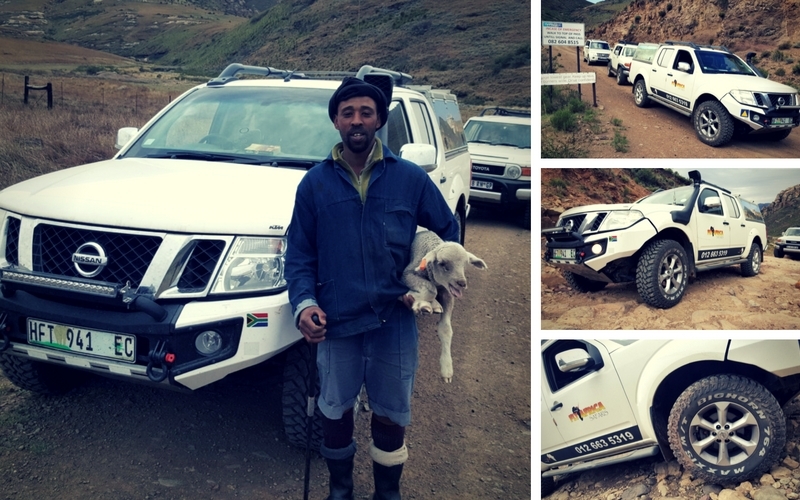 Then we travelled from the farming community of Wartrail up to the high plateau, traversing the Volunteershoek Pass. The road is narrow with some precipitous drop-offs. After the steepest section, the road gives wonderful views of Halstone Krans and the valley farmlands beyond. There are some interesting rock formations along this section, the most notable of which is ‘Funnystone’ which lends its name to the farm opposite. We stopped for lunch at Tiffendell. Tiffindell Resort was established in 1993 to give South Africans an opportunity to ski near their homes and others to ski in Africa. The carefully selected position of the resort, on the south facing slope, ensures that the snow lasts, extending the time available for snow skiing. Slopes cleared and groomed during summer quickly transform to ski runs after even the lightest of snowfalls.The road from Tiffendell to Rhodes is scenic and steep. You need controlled power, particularly where the cement strips zigzag their way down the most extreme section of the Carlislehoek Pass. You will pass under the highest point in the Cape (3.001m above sea level). Known by local tribes as ‘Makhollo’ (Great Mother), the Europeans named this peak Ben McDhui after the mountain in Scotland and it is affectionately referred to as BenMac by local residents. Afterwards we drove to Naude’s Neck. With a summit of over 2,920m above sea level, Naudés Nek Pass is the highest dirt road in South Africa. Connecting Maclear with historical Rhodes this pass is based on the route taken by the intrepid Naudé brothers in the 1890s. Following the path that their horses instinctively took they carved out the route with picks and shovels. We then drive via the towns of Maclear and Elliot and the braver ones in the group tackled the Bastervoetpad Pass and met the rest of the group at the Mountain ShadowsHotel. The Mountain Shadows Hotel is situated amongst the picturesque mountains of the Southern Drakensberg Mountains, in the heart of the Eastern Cape. In the Drakensberg range, each season has its own beauty and sandstone formations form part of the environment. The hotel is at the top of the Barkly Pass with a height of 1990 meter above sea level and that is where we will spend our final night together. Sadly after breakfast, we said our goodbyes and everybody headed in their own direction.